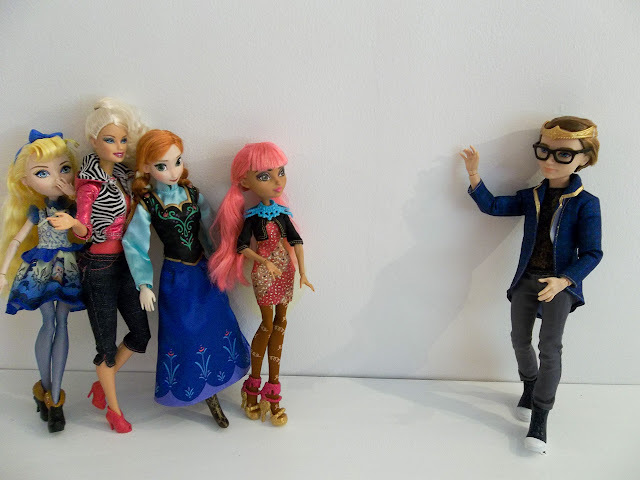 Ever After High's Dexter Charming and Adora's 18-inch Kayla--A Joint Review! I feel especially fortunate to have such a fun mix of guest reviews this week because I seem to have come down with my first nasty cold of the season. Blah. That's the only thing I don't like about fall--the return of sickness. But the timing really worked out perfectly. My two guests, Grace and Dot, have put together wonderful, complimentary reviews that required practically no effort on my part. These two have also lifted my spirits with their contagious enthusiasm, energy and humor. So, a big thank-you to Grace for sharing her handsome Dexter Charming with us, and to Dot for her very special review of Adora's 18-inch Kayla doll. To start things off, I'd like to introduce Grace, a fellow doll enthusiast and accomplished seamstress. Grace's creativity shines on her own blog, Doll Dimensions. Grace designed her blog to be a place where people can find tutorials for doll items that will expand their play and collecting dimensions. This blog features makeovers, sewing ideas, reviews and even (my personal favorite) a showcase of Grace's own version of Cinderella (Ginger Ella). I think this Dexter Charming review captures the spirit of the Doll Dimensions blog really well. Tell us more about your handsome guy, Grace! Hey everyone!!! I'm super, super excited to be doing this guest review!! I love Emily's blog, and her reviews and photos are my absolute favorites. Today I'll be reviewing a very handsome fellow by the name of Dexter Charming! I absolutely LOVE Dexter (don't tell anyone, but I think that I like him better than Ken ;) )! Unfortunately, I was only able to get my hands on the second edition (re-release) of Dexter, so he is missing some of his accessories. However, I was able to replicate some of the missing ones, and I'll share how I did it at the end of this post. It feels wonderful to be able to showcase a few final guest reviewers here on the blog. I have two more guest posts after this one, and all of these reviewers have put so much thought and enthusiasm into their work--it's inspiring. Today's lovely guest, Carissa, emailed last September to suggest a Hello Kitty figure review. She thought it would make a nice expansion for my brief Jada and Blip Hello Kitty toy comparison, and I totally agreed. However, a few months later the Lalaloopsy Pet Pals animals were released and both Carissa and I were completely charmed. So, Carissa offered to write a review of the new animal minis instead, and proposed some excellent ideas for comparisons. But there are so many fun Lalaloopsy products these days, I got carried away and kept suggesting additions to Carissa's post: How about one of the large Pet Pals for comparison? Are they the same size as the Littles? Ooh--and maybe you could also compare a Mooshka mini? Hey, and you know those cute little playsets? I bet those would look sooo adorable with the minis...you get the idea. By the middle of the summer, Carissa had cheerfully agreed to review half of the Lalaloopsy lineup. She's pretty amazing. So, today Carissa will feature the Lalaloopsy mini Pet Pal pig (Belly Curly Tail) and will compare her to the full size Belly Curly Tail figure. She will also compare the full-sized Belly to a Lalaloopsy Little. As an extra bonus, Carissa took the time to compare the Belly mini to two other Lalaloopsy Pet Pal minis (Wooly Fuzzy Fleece and Tickles B. Nana) and to the Mooshka Fairy Tales mini fox! There's even a playset included at the end of the review...along with a couple of other fun surprises. In order to keep the post from being too long, Carissa uploaded many of her extra photographs into a gorgeous Flickr album. I highly recommend taking a peek at these bright, detailed shots. They really add a lot to the review. I hope that this post will be a treat for Lalaloopsy fans and a great overview for those who are not yet familiar with this whimsical brand. Welcome to Carissa's incredible Lalaloopsy Pet Pals extravaganza! 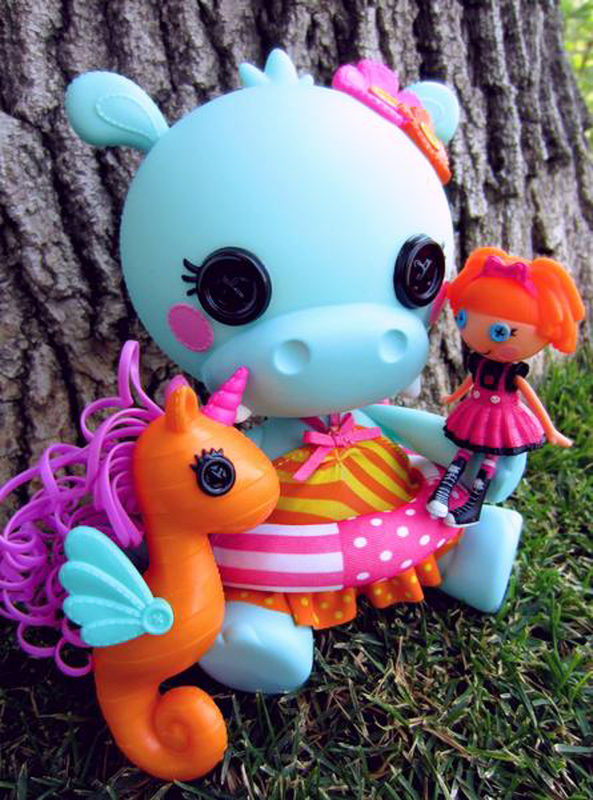 Lalaloopsy Pet Pals "Toothy Yawns-a-lot" hippo (and friends!). This is the first Bratz doll review I've ever written, which feels strange given the impact of this brand in recent play doll history. I like MGA's spin-off Bratzillaz dolls, but have never been a great admirer of Bratz themselves--mostly because of their bratty, haughty image (brace yourself for some hypocrisy on that statement later on, though). My feelings about Bratz dolls started to change after Samehch's 2014 guest overview. Seeing the dolls through Samehch's eyes gave me a new appreciation for these personality-packed, fashionable characters. In fact, I've actually purchased a few Bratz dolls for my collection in the past year. 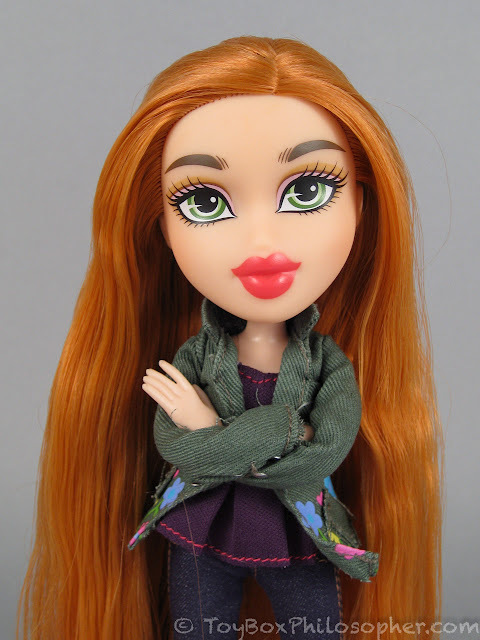 At the time of that guest review, MGA had just put the Bratz line on hiatus in the United States market, preparing for a big 2015 re-release. Bratz dolls continued to be sold in other countries during this hiatus. The overseas selection during this time included a wonderfully clever and creative Bratz idea: the Duct Tape Fashion dolls. As a person whose wallet is made completely out of Duct Tape, I heartily approve of this concept. There's a very charming video review of Duct Tape Yasmin on YouTube. Even though this particular video doesn't show how the Duct Tape customization works, I highly recommend watching it anyway--especially the part where the charismatic young reviewer expertly fills time while her poor father de-boxes Yasmin. It's classic. Create-A-Bratz doll from Target, $49.99. This post will mark a bittersweet crossroads for the blog. On the bitter side, I'm no longer accepting new full-length guest reviews, and so today's guest review will be among the last of its kind (there are just a few more reviews waiting in my inbox). The sweet part is that it will be the very first time I get to show off some wonderful Photo Mission pictures--a new way to share everyone's photographs and thoughts here on the blog. And in the midst of all this, I've included my own mini review. So...there's a lot going on here today! I think it's fun to have so many voices and talents in one review, and I can't think of a better doll line to accommodate this than the creative and whimsical Ever After High. My guest reviewer today is Cory, who--like so many of my guest reviewers--is one of the most patient and lovely people in the world. She first emailed me about a possible guest review back in May, so you can see when she started this review and how long she's been waiting for me to get my act together to publish it. Cory is a hard-working college student and a budding doll reviewer. She collects Ever After High dolls and will show you two of those dolls today: Bunny Blanc and Sugar-Coated Madeline Hatter. Ever After High's Way Too Wonderland Kitty Cheshire. I got temporarily swallowed up by the pandemonium of school, but now life has begun to settle back into a familiar rhythm. I did manage to make a few changes to the blog last week that you might have already noticed: there's a tab menu at the top of the site that has a few little additions. In particular, I'd like to point out the "Photo Mission!" tab. These photo requests will change from time to time, and I hope they'll provide an easy way for anyone to contribute to a review, add an opinion, or maybe even share a website link. The first mission is for Ever After High pictures (of any kind!) and these will be published next week as part of a larger review. Thank you to those who have already contributed! It's so fun to get pictures in my inbox. It's also fun to get new doll alerts in my inbox. For example, I received an email from Nadine a week or so ago, telling me about a whole new line of dolls by Battat. The line is called "Lori" and includes a variety of 6-inch dolls (formerly the Our Generation mini dolls) along with several outfits and accessories. I was so excited to hear about these dolls because I'm a pretty big fan of the Our Generation minis...and of the Battat company in general. The strange thing was, I had been to Target the very same day that Nadine emailed me, but hadn't seen any sign of the Lori dolls. I made a few more trips to Target that week (three or four...) and was finally rewarded towards the end of last week when my Target stocked the new collection. I think some of the items sold out quickly, but there were still about six different doll characters, a few outfits, four furniture sets, and even a two-room wooden dollhouse. 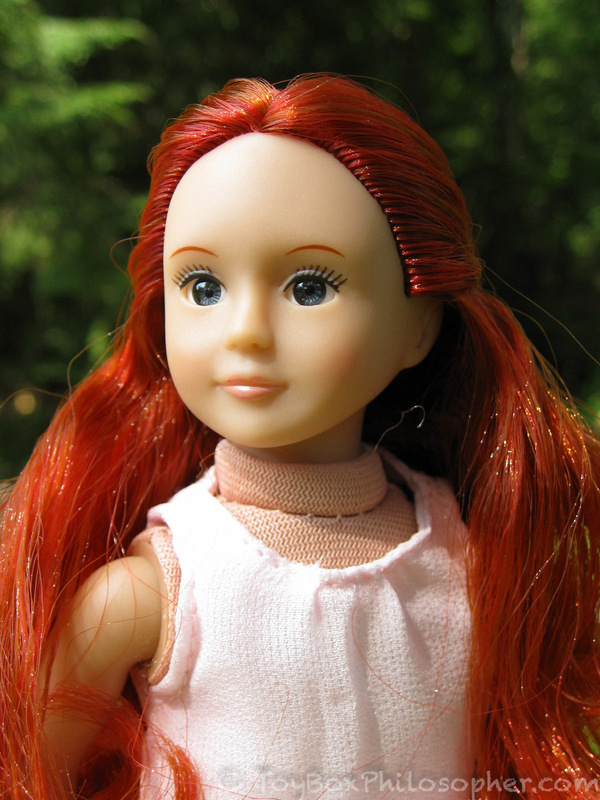 Lori doll "Bryn" by Battat, $15.99.